A INQUISITIVE REVIEW ON: COMIC BOOKS*GRAPHIC NOVELS *ALSO AN OCCASIONAL COMMMENTARY ON THE MEDIUM OF COMICS. Amazing Award Winner Movie on DVD! THE RETURN OF CAPTAIN MARVEL! Happy Fourth of July 2006! By John L. Daniels, Jr.
After viewing the murder of her mother at the hands of her Aunt Redd, Alyss escapes through a mirror with her bodyguard Hatter Madigan. Hatter Madigan is feeling guilty at losing her during their escape from the clutches of her Aunt Redd. Hatter Madigan must find Alyss, return her back to wonderland, and return her to her rightful place on the throne. The book originally published by EGMONT Co. UK. It was nominated for three literary awards in the United Kingdom: the 2006 Leicester’s book of the year award; the 2004 Carnegie Medal nominee, and the 2005 Staffordshire Young Teenage Fiction Award. The Looking Glass Wars have arrived in the U.S. with the vigor of a definitive literary masterpiece. This book is an impressive read with a comparison to the Alice in Wonderland story written by Lewis Carroll. 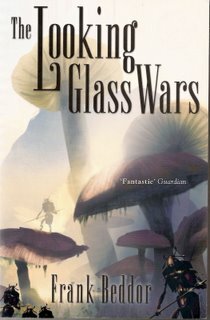 Only The Looking Glass Wars written by Frank Beddor is astonishing in measure due to the historical background in this legendary tale. I had an opportunity to ask Mr. Beddor a question about the Looking Glass Wars. What was your inspiration in writing the Novel –The Looking Glass Wars? A number of years ago I was in London for the European premiere of THERE'S SOMETHING ABOUT MARY. I went to the British Museum and saw an exhibit of ancient cards. For instance, Napoleon hired artists to hand paint depictions of his many victories in battle. But what caught my attention, at the very end of the exhibit, was an incomplete deck of cards illuminated by an unusual glow, almost as though they were alive. I was intrigued by the exhibit and captivated by the images on the cards. This was a very, very different version of Wonderland. For the remainder of my trip I was preoccupied with the images and told several friends, one of whom suggested I meet with an antiquities dealer he knew who specialized in collecting all sorts of ancient playing cards. The next morning, on the way to the airport, I stopped at the dealer's shop. When I told him about the unusual exhibit, he revealed that he in fact owned the cards missing from the deck. I was stunned. He brought out this old, worn leather box filled with cards and told me the story as he flipped one card over at a time, revealing the saga of THE LOOKING GLASS WARS. It was a darker Alyss from a darker world and I knew I was meant to tell the story. 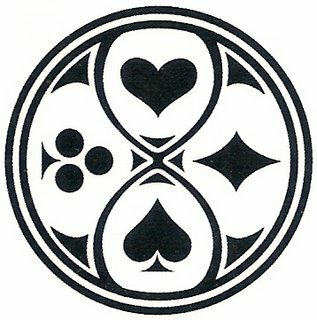 Once I discovered the truth behind the deck of playing cards it soon became clear that Lewis Carroll had changed everything. I began putting all the pieces together and weaving the revelations of just how different the real Wonderland and its inhabitants were compared to the children's lit version the world had known and accepted for nearly 150 years. Carroll's choices in how he changed Alyss's story were so fascinating (he even changed her name!) - the monsters and heroes of her lost world became these cheery reinventions. It was such a betrayal on Carroll's part and was in fact, the reason for the rift that eventually occurred between the writer and his muse. For instance - the characters we know as the White Rabbit, the Red Queen, the Cheshire Cat and of course, the Mad Hatter all appear in The Looking Glass Wars as they were intended to by Alyss when she told Carroll her harrowing tale. The White Rabbit was in fact Bibwit Harte, the six foot tall albino royal tutor for all Wonderland Queens (Carroll had anagrammed his name to create the White Rabbit), while the Red Queen was in truth Alyss's aunt Redd, the revenge maddened usurper to the throne ably assisted by her top assassin, The Cat, a man size feline who morphs from adorable kitten to giant mutant feline when called upon to kill. So you see, there is a lot of truth to be uncovered. After reading the LGW book, I have never been as enthusiastic about a novel or a comic series quite like this one. 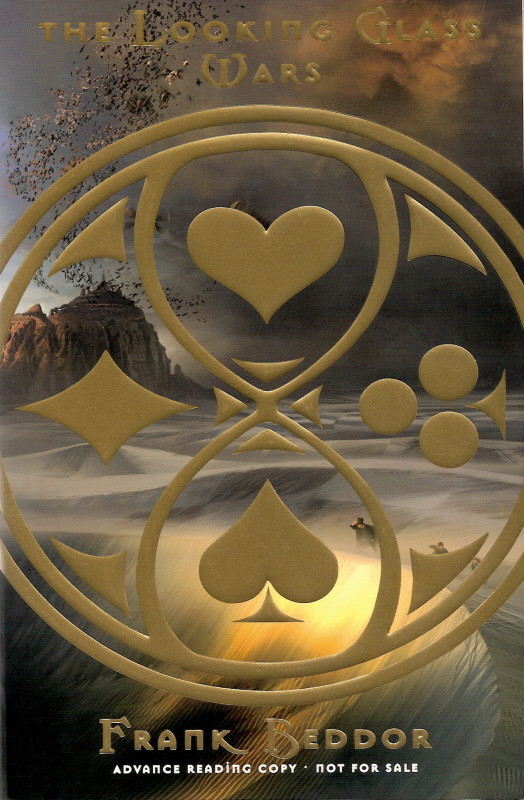 The Looking Glass Wars captures the reader’s imagination and keeps them in suspense concerning the search for Alyss and wondering if Alyss can ever be found and return to her rightful place on the Wonderland throne. Frank Beddor uses his knowledge from Hollywood, for which he is the producer of the incredible comedy “There’s something about Mary” and brings forth followers of the glow with his dramatic and media savvy website www.lookingglasswars.com. In addition, a soundtrack is forthcoming as well as an audio book of the novel, of which I have heard a sample. The audio book is entertaining and paced very well for listeners of all ages. Not since I have heard Jeff Wayne’s Musical version of “The War of the Worlds” featuring the late Sir Richard Burton have I heard such a regal interpretation of a novel. Also in production is The Looking Glass Wars will also become a card game. The Looking Glass Wars novel and the Hatter M: Looking Glass Wars comic book is extraordinary reading that will amaze and astound its’ readers. Therefore, readers walk no run, read, and follow the glow read one of the most brilliantly written novels in modern history The Looking Glass Wars.